We’ve only seen one so-called live photo of the Galaxy S8 even though countless purported renders of the device has been posted online so far. The general perception that we have of the next flagship smartphone is that it’s going to have a very impressive screen-to-body ratio which will result in super-thin bezels. The front of the device will basically look like one big glass display and that’s reiterated by another live photo of the Galaxy S8 that has leaked out today. 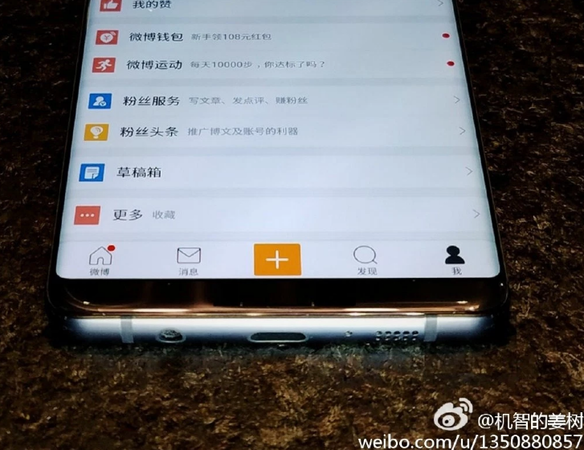 The latest live photo of the Galaxy S8 only shows the lower half of the device but we can see that it has a dual-edge curved display with an impressive lack of bezel. We can also see the standard 3.5mm headphone jack as well as a USB Type-C port. Two antenna lines and the speaker grille can be seen as well. Granted that this picture was posted on Weibo, China’s version of Twitter, and hasn’t been verified but it does fit in nicely with everything that we’ve heard about the Galaxy S8 so far. We should expect to see more leaks related to the Galaxy S8 in the days leading up to its launch later next month. I see they didn’t go with a fully black metal trim, shame because that looks much sleeker than the gunmetal gray colour. Fake or not with this new near bezel less design this thing is going to sell like hotcakes!! Many people will miss the home button, atleast your typical average joe who bought iphones and Galaxys in the past. -Nougat on S7’s before the S8 comes. I need to stop reading this website with all the fake stuff they post. The bottom is an S7 Edge. The lazy fakers didn’t even change the MicroUSB to USB-C.
At least photoshop a Note7 bottom if you’re going to fake. Its fake. That’s the Note 7’s bottom end photoshoped. It’s not even a Note7. The port is clearly MicroUSB, with a poor attempt to photoshop it to be more circular. Nope. The note 7 never came in that colour. Round corners as well? LOL. I’m not buying that piece of crap. well the speaker grill matches the current Samsung flagships, but the USB C port looks too much like a photoshopped USB Type B port. where are the onscreen buttons or are we supposed to navigate differently?